Is Your Estate Plan Up-to-Date? | The Levin Law Firm - Philip Levin, Esq. Make this season the one where you resolve to get your estate plan in order. Unlike my previous newsletters, this one is expressly directed to you, the advisor, as it is my experience that when financial advisors have their affairs in order, they are more likely to ensure that their clients do too. 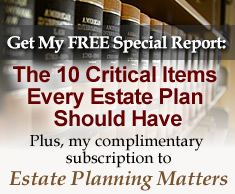 If you do not have an up-to-date estate plan, you certainly are not alone. You will be in the company of Jimi Hendrix, Bob Marley, Sonny Bono, Stieg Larsson, Pablo Picasso and Abraham Lincoln. All of them died without creating a valid Will. The court fight over Jimi Hendrix’s assets lasted 30 years. Bob Marley was diagnosed with cancer eight months before his death and he still did not do prepare a Will. Sonny Bono died suddenly in a ski accident without any Will in place. His ex-wife Cher filed claims and a love child appeared looking for a share of his estate. When Stieg Larsson, author of the book, The Girl With The Dragon Tattoo, died suddenly of a heart attack without having a Will, his lifelong partner of 32 years received nothing; Swedish law divided his intestate estate between his father and his brother. More specifically, the law in the state in which you are domiciled and own property has written a Will for you under their intestate statute. Almost without exception, intestacy laws are not the ones you would like applied for the distribution of assets you have worked hard to accumulate over your life. This is especially true if you are unmarried, have children from different marriages, family conflict, charitable intentions, or own one or more businesses. Gather Your Personal and Financial Information. Take time to sit down with your spouse/significant other and review it. Is it all in order? Are all your beneficiaries (primary and secondary) up-to-date? Are your assets titled properly (individual name, jointly owned, or in trust)? Do you have copies of all your important documents and passwords, and do you each know how to access them? What if something happens to both of you? Who else has that knowledge? Review Your Insurance Coverage. Is all your insurance up-to-date with adequate coverage amounts? Review life insurance, disability insurance, long-term care insurance, property and casualty insurance, and your umbrella liability policy. Financial and Health-Care Protection. Make sure every adult member of your family, including you, your partner/spouse, your children and your parents have up-to-date Durable Financial Powers of Attorney and Health-Care Powers of Attorney. Review Your Estate Planning Documents, Based Upon Your Current Personal, Financial, and Family Circumstances, along with Tax Law Changes. With the assistance of your estate planning attorney, review your legal documents, not just from a technical point of view, but also from an operational point of view. For example, if you died today, would your property distribute to the right people, at the right time, and in the proper manner? Would a trust-based plan be wise for one or more of your beneficiaries, compared to an immediate outright distribution of your property? Examine the practical and tax consequences of your current Will or Trust. Prepare an Income and Asset Analysis. If you became injured, incapacitated, or passed away today, would your surviving family members have a good understanding of the asset size and structure of your estate? Do you have a financial plan and is it up-to-date? If you became disabled or died, would the people you care for now be provided for in the proper manner? Review Your Fiduciary Selections. Who have you appointed as Executor and Guardian under the terms of your Will, as well as Agent under your Financial Power of Attorney and Health-Care Power of Attorney? Are the current fiduciaries under your existing estate plan still appropriate, or should your selections be modified, based upon changes which have occurred in recent years? Who is named as Trustee for any property which you own that you do not want distributed outright in the event of your death? Have you made back-up choices for your fiduciaries in the event that one or more people you have selected to serve as a fiduciary become unable or unavailable to carry out their responsibilities to your family, and are your selections still the right ones? Communicate Your Wishes Clearly. Consider writing a Letter of Instructions to those people who you have selected to handle your affairs, as well as family members, which convey thoughts that you may not wish to express now while you are alive, but that would be important for others to know later. Update Your Contact List. Prepare a list of all your professional advisers, including their updated contact information. Please take time this Spring to review these eight (8) estate planning resolutions, and make sure that you have truly accomplished them…..then encourage your clients to do the same. To learn more about how The Levin Law Firm can create a comprehensive estate plan designed to help you achieve your wealth transfer, business transition, and retirement distribution goals, please contact our office to arrange a Complimentary Consultation at (610) 977-2443.